Thank you for your interest in purchasing a Choose Life License Plate. The more plates we sell, the more support we can provide to agencies that support the positive choices of life, adoption and safe havens. When you purchase a Choose Life License Plate, the cost of the plate is $40 more than your regular registration fee. For example, if you are renewing your registration, the renewal fee is $60 and the Choose Life plate fee is $40 so your total cost would be $100. If you are swapping your plate, the swapping fee is $20 and the Choose Life plate fee is $40 so your total cost is $60. (We do our best to provide accurate information but please be advised that the registry portion of the fee is subject to change so the registration fee or swapping fee could be different. The fee is determined by the State of Massachusetts. ) When you first purchase the Choose Life plate, the registry keep $12 to pay for the cost of manufacturing the plate and Choose Life, Inc. receives $28. When you renew the plate, Choose Life receives the full $40! Forty dollars every two years is not a huge amount of money but with over three thousand plates on the road we can do great things! 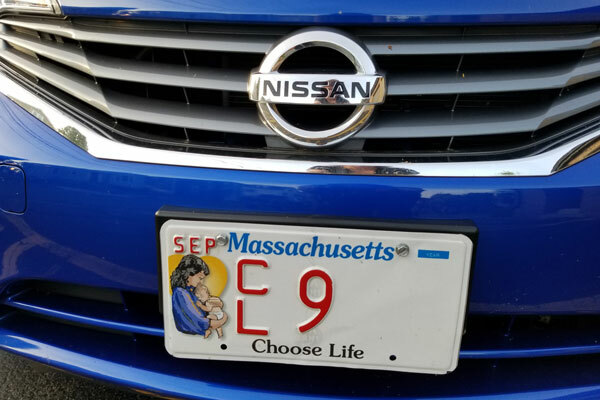 The Choose Life License Plate is available at your local registry of motor vehicles. To find the nearest registry, visit the Massachusetts Registry of Motor Vehicles – Branch Info Page. You can also order your Choose Life License Plate online. It’s easy! Just have your vehicle registration on hand and visit the Massachusetts Registry of Motor Vehicles – Special Plate Order Page. Your plate will be shipped to your home.